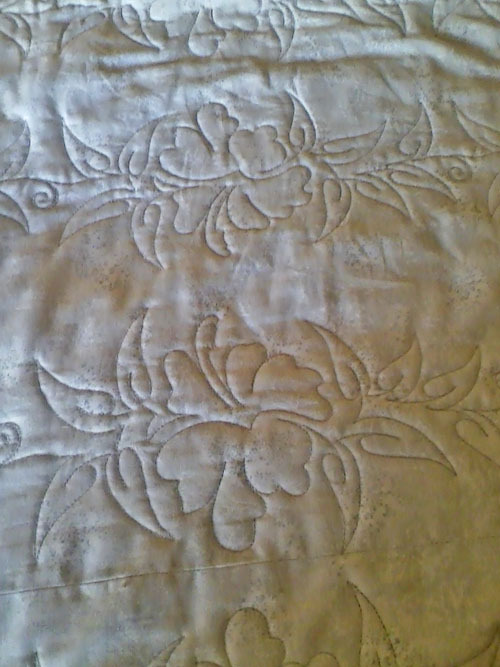 Suzanne Jarvis shares her awesome Hawaiian appliqué quilt! Once I started cutting them out, I couldn’t stop! It was hard to find a background fabric that wouldn’t distract from the Hawaiian prints, so I picked a charcoal marble by Moda. They seemed to go well together. 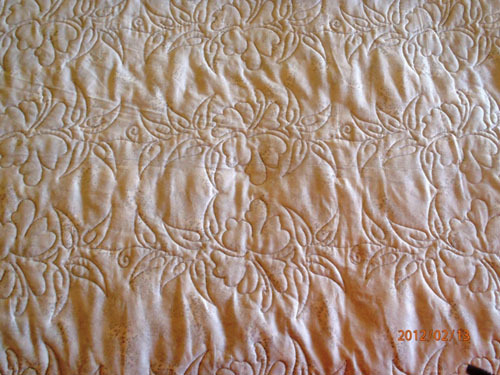 I just finished quilting it with QuiltMotion software and my BERNINA 820. 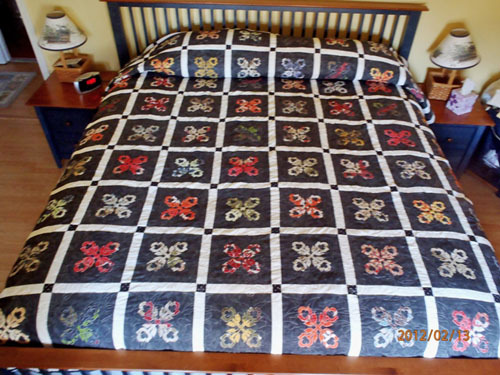 I wanted the quilt to fit either a queen or king bed, so I used 9 blocks across and 9 blocks down. I don’t think I’ll do that again. 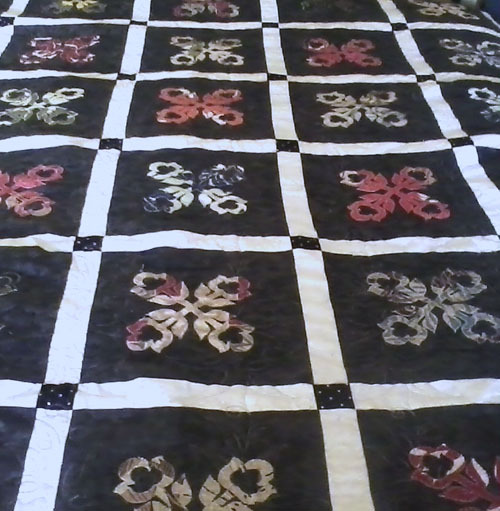 It was wider than the quilting area of the frame, so I had to turn it and do half at a time. I understand Grace is coming out with a 2 foot extension to the frame; that will help with large quilts. Mine was 107” square. 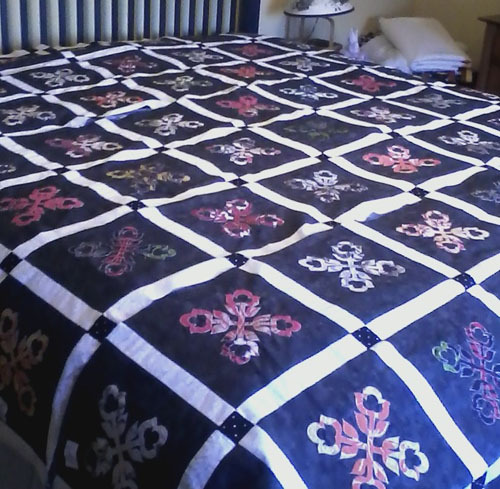 Next time I’ll make 9 blocks across and 8 blocks down, so it will fit on the quilting frame and I won’t have to turn the quilt to do the borders. I can’t wait to do other cutwork designs – I have so many ideas! Why didn’t I start this hobby years ago? Your quilt is absolutely beautiful and inspiring! I’m curious though if you used monofilament thread since the stitching doesn’t appear to be very noticeable. If so, do you have any tips for using it? I continue to find it hard to use on my Bernina 830. Thanks for sharing!